Citi has begun testing a screenless, cardless ATM concept developed by Diebold that lets customers make transactions using their mobile device instead of a plastic card and authenticate themselves using NFC, QR or an iris scan. 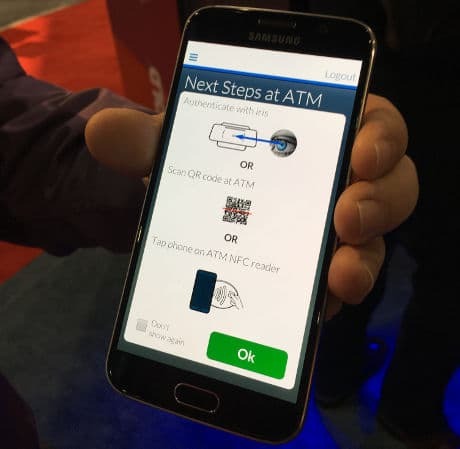 “Really, what this is aimed at is the tech-savvy individual,” Richard Harris, Diebold’s VP of new technology, incubation and design told NFC World during a product demonstration at Money20/20. “They do a lot of their banking online, they do a lot of banking on their mobile phone and this is a concept that really fits that particular consumer. “We came up with this as a concept in the early part of the year and we had some meetings with Citi. We were focused, at that point, on mainly the NFC and QR aspect but when we started getting into discussions, they were really interested in experimenting around some biometrics as well. “We’re working through productization around this particular unit,” Harris added. “Certainly from an NFC and QR code standpoint, we use that technology today in our existing products. The iris scanning is relatively new — we’re looking at making that more passive. That’s where we need to enhance it. Everything else, the NFC and QR code, there’s no reason why we can’t take that into a product range now. The company is also demonstrating a second banking concept called Janus, a dual-sided, self-service terminal equipped with a tabletop touchscreen and an NFC authentication method for performing banking transactions that have also been logged by the consumer using their mobile device. Diebold revealed last week that it has teamed up with HCE specialist SimplyTapp to offer banks a way to use their ATM network to add a layer of card present security to their mobile wallet provisioning process. Magnetic stripe and PIN at trusted devices is the earliest and most successful example of strong authentication. However, as demonstrated by the dramatic increase in ATM fraud over the last few years demonstrates that it is clearly at the end of its useful life. However Citi promotes this as an accommodation to changing customer preferences, it also illustrates the huge potential for improved security, not to mention cheaper ATMs, possible with mobile computers. It is likely that, for reasons of backwards compatibility, we will live with magnetic stripe and fraudulent replay of credit card numbers for a decade or more. It is notable that this technology can coexist with legacy ATMs but the sooner we move to mobile, the better.